This trend is also true for Denmark and to a large extent, France. I grew up where curtains were either non-existent or used merely for decor but never to keep people from seeing in. There is a certain sense of community that grows when you can see lights, activity and people inside homes/buildings. I love walking the streets of Paris and seeing people eat supper or walking in a little town in Denmark and see someone playing piano. I also confess to loving the ability to see how people decorate! 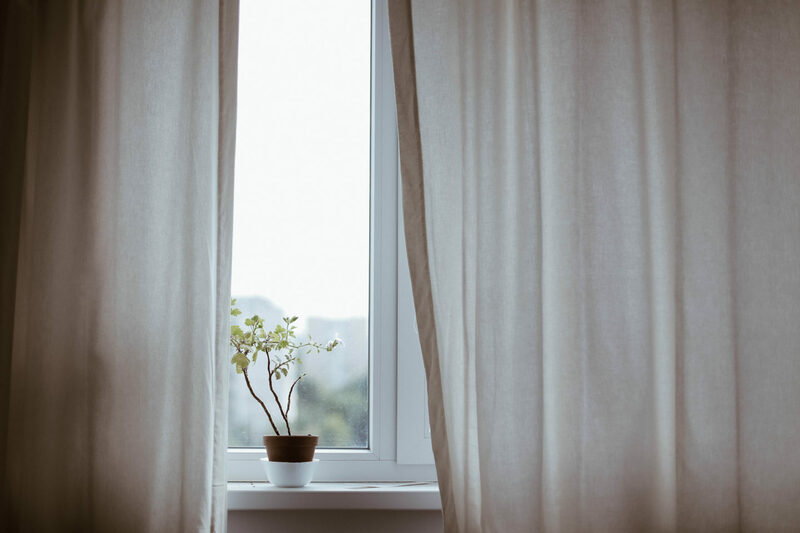 However, living in American cities such as Seattle, Nasvhille, Santa Monica, Austin and having been to many homes throughout the country, it has been my experience to note that most often curtains are hung and drawn leaving the outside world, the views and the people – blocked out. For me, it really affects how I feel about a neighbourhood when I can never see anyone or anything. I adore curtains but for aesthetic reasons. I love fabrics and having the pool around the windows onto the floor. But I very seldom ever have them closed – even when I lived ground level beside a main walkway and side walk. Weather is probably the only thing that’ll make me close them – to keep the heat/cold out. In Carmel by the Sea the multi-million dollar homes very seldom have curtains and if they do, like mine they’re never closed. People want to soak in the view and the sun here and it’s been great to peak around the streets and see all the amazing interiors. I only have curtains in the office/bedroom and kitchen here but the living room is wide open. And I like it that way. Curtains I adore: Anthropologie and the Carlisile Drapes from Pottery Barn are a classic (and inexpensive) staple. It’s the same here in Sweden, I don’t know anyone who use heavy curtains and people seldom have their blinds down during daytime. We want all precious light we can get! When I have lived on the ground floor I usually feel a little uncomfortable at first having all those people being able to look inside, but after a while I just forget about it. My husband is Danish, and I sure wish he had picked up that whole not minding if the windows were open thing. He used to be worse when we lived in apartments, but still when he gets home from work he comes and pulls down the blinds in the living room. It drives me batty. I need light. I love light! His parents curtains can’t even close so he certainly didn’t learn it from them. Oh well, we’ve been married nine years and I’m slowly wearing him down. My husband and I live in Vancouver’s West End. We’ve had a grund floor apartment for 6 1/2 years and my husband is always commenting that everyone likes to look in our Windows! He is from Mexico where people live behind huge cement walls and have bars on their windows. (For safety). It’s funny how differently we all live in different parts of the world. I love walking through the West end at night and looking in everyone elses windows! I love your blog. I’m learning so much from it– thank you. I read this post about curtains and as an American, I find these remarks interesting and in some ways amusing (and I don’t mean that in a negative way). I love being able to see the life going on in people’s homes, but with my own home, especially during dinnertime, I always feel a little sense of relief when I pull down the shades. It makes me feel as though I can shut out the world and my family can have its own little corner that’s none of anybody’s business. I feel a little like a zoo animal eating dinner with the windows open. But it seems my thinking is the opposite of the cultural thinking you describe. I wonder if some of this comes from living in a society I perceive as so large and so– disparate?– that it becomes very comforting to shut it out and have privacy. I love where I live, and I’m very happy being American, but maybe living in a smaller, more uniform, more predictable society gives people a different sense of their relationship with the public eye.